When using the Ladybug 2150 steam cleaner in our homes, we are always thrilled to sanitize, clean and deodorize in one simple operation. A Ladybug steam cleaner is a must for allergy sufferers and those with respiratory ailments since only tap water is used to destroy germs, viruses, molds and bacteria – no more use of harsh chemicals! 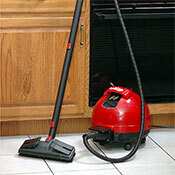 Overall, the Ladybug 2150 is a top-of-the-line steam cleaner at an affordable price. The Ladybug 2150 does not have a pressure steam gauge. If you want a pressure gauge to maintain the ideal pressure when steaming, we suggest the Ladybug 2200S model. We had to think very hard to come up with any minuses for the Ladybug models. The Ladybug 2150 Steam Cleaner is a top quality machine and for good reason. If you want a superb quality machine with excellent performance, these steam cleaners will not let you down. Their ease of use, continuous fill, safety features, quality of tools, and overall quality of the machine make it a winner. Winter Allergies or A Cold?